As the old saying goes, a workman is only as good as his tools, and for the ninja warrior his weapons were his tools. In the case of the ninja however, this workman was equipped to the highest standard possible, with a massive arsenal. For the ninja his weapons were the tools of his trade and allowed them to defend themselves from a variety of ranges and positions. In many ways the ninja was one of the most equipped warriors ever to exist with an arsenal that was fully comprehensive, from edged weapons like the katana to projectiles like the famous shuriken. We will detail all the key weapons of the ninja in much more details, and cover why and when it was used. The katana was often considered the primary weapon of the ninja warrior, and this classic Japanese sword was traditionally known as a samurai sword due to its prominent use by the samurai in the feudal era. Being a popular weapon is likely why the ninja used the katana, its design obviously proven and it was easily carried on the hip or on the back. There is much debate as to whether the ninja actually used a shortened version of the katana. This would have made it easier to carry and conceal and would have allowed the ninja more freedom of movement, when carrying the sword in transit. 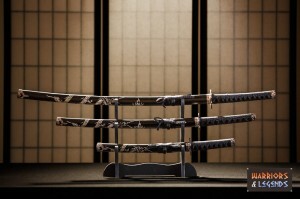 A range of Japanese swords used by the Ninja, the Katana, Wakizashi and Tanto. The throwing darts, blades and spikes of the ninja warrior the shuriken is another weapon that instantly says ninja. The name shuriken, literally means ‘a sword hidden in the hand’ and as we mentioned earlier they did not just come in one shape or size. The variety of the shuriken is a really interesting subject in its own right, it was likely a personal thing, that a ninja would have his favourite style of shuriken and the many varieties probably stemmed from this. Bo shuriken were the dart style shuriken and were essentially metal spikes with a variety of faces and edges. The typical size was smaller and larger than average hand size from 5 to 8 inches roughly, allowing them to either be held or concealed in the hand depending on the size. The shape of the bo shuriken meant that the ninja could employ various methods to launch them. Underhand, overhand, sideways and backwards, the bo shuriken were versatile tools in the hands of a skilled ninja. 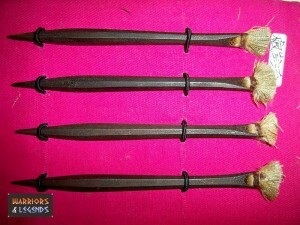 A selection of iron bo shuriken with cotton flights. The most common of the two shuriken types was the Hira shuriken, the common star or triangular shaped shuriken. This design normally had a central hole, allowing the shuriken to be hung on a chain, or small rope or string. The many designs of these shuriken were often personally attached to the ninja school or trainer. The kama was a sickle whose origins lied in farming. It was typically used to cut crops and is common in a range of styles and shapes. Short in length an easily wield-able with one hand, the kama typically sported a blade almost 2/3rd of the lent of its wooden handle. Due to its easily decidable nature, the kama was often used in a pair, giving the ninja a fast paced attack weapon that could be used to strike with the tip or with a sweeping motion. The kusarigama was essentially a sickle(kama) with a metal weighted chain attached to it(kusari). This relatively simple looking weapon took real skill to master well, and even had it’s own specialised art known at kurarigamajutsu. The sickle was short enough to wield effectively with one hand and the other could be used to handle the chain. It was even common for some ninja to wield two kursarigama. 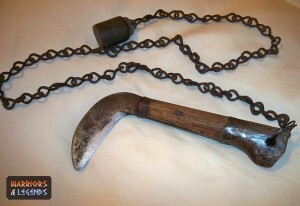 A single ninja Kusarigama, a sickle with a weighted metal chain attached. The benefit of this weapon was that it afforded the user some security in edged weapon combat. The ninja could swing the chain at their foe, with the goal of wrapping up an arm, a wrist, or disabling a weapon like a sword or blade. Once their foe was somewhat entangled, the ninja could move forward to attack with the sickle. The Bo was a long staff, typically just under 2 metres long and was typically made of a local hard wood. Like many other weapons, the ninja would wield the bo using bojutsu, the special art dedicated to this weapon. The range of attack and defence moves were plentiful with the bo, and it actually shares many moves with other common staff weapons like the spear or the glaive. The fukiya was blowgun used by ninja to strike from a distance. The tube was typically over 1 metre in length, which is around 3 feet and the darts were typically 20 cm or around 8 inches in length. It’s thought that the ninja may have carried slightly smaller versions also, although this would have affected the striking range of the fukiya. Used correctly the Fukiya was capable of shooting very accurately, and with a dart a ninja might injure, aggravate, confuse or even kill a target. It’s also thought that the ninja would have also used poisoned tipped darts to take down their foe. The naginata was was a pole-arm weapons with a curved blade attached to the shaft. Similar in fashion to a glaive the naginata was typically long, around 6ft or 200-230 cm in length, making it a perfect weapon to keep the fight at a safe distance. It was common for naginata to be expertly weighted, allowing the ninja to wield it not only for tradition stabbing, striking or hooking attacks, but also for much more agile sweeping and spinning attacks. How useful a naginata would have been to a ninja is questionable, if they were sure of confrontation, then it would surely have been a good weapon choice, but its sheer size would have made it impracticable for many missions that the ninja would undertake. The nunchaku, often known as nunchucks is one of the weapons that would have been available to the ninja should they require it, and was typically two short sticks tied together with a rope or chain. The sticks were commonly wood and together the nunchaku would allow for a user to attack in a variety of ways. The initial benefit of the nunchaku to the ninja is obvious, due to the folding design, they would have been easily transportable and would have simply tucked into a belt or fasted to the waist. When in the hands of an expert the nunchaku at its full length would have been double its folded length, giving the ninja a longer weapon to strike with. The tanto translated as the ‘short blade’ was popular with the ninja due to its small size and easily portability. 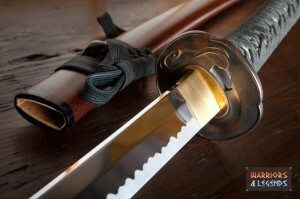 The blade of a tanto itself was typically around 15 to 35 cm, working out around 6-12 inches. The tanto was housed in a small handle which typically came with a sheath to protect the wearer when transporting the blade. While not known for its slashing ability, the tanta was commonly used to stab or strike and would have likely been a second choice weapon or pulled in very specific circumstances. The kunai was a small Japanese farming tool/blade, typically around 20 to 50 cm in length with a leaf shaped blade and a handle with a ring. The ring would have a pommel attached which could be used as a handle grip or to attach the kunai to a belt or limb. The Kunai was designed to be used as a stabbing weapon but was also capable of being thrown if needed. Diverse and varied, the ninja warrior was never short of a weapon choice. From the legendary katana blade to the throwing stars known as shuriken, the ninja not only had to master many weapons but also had to choose when to use each. It was this level of mastery and range of choices that makes the ninja a true weaponry expert.